Sometimes I want to 'correct these coordinates' before uploading the cache to my GPS. But there are some pages where the pencil (to correct coordinates) leads me to the advanged search page, instead of letting me correct the coords. Does it actually take you to the search page when you click on it? The URL shows the same for me, but when I click on it, it allows me to change the cache coordinates. Yes, sometimes it takes me to the searchpage. Not always, but with this cache it did. 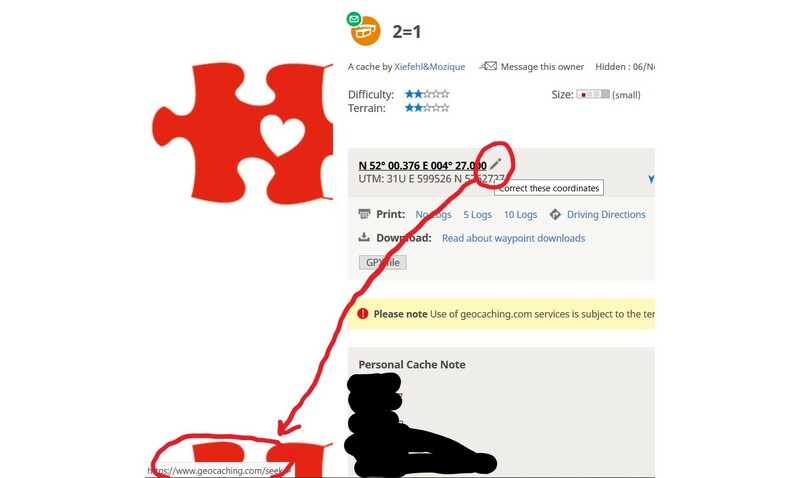 What is the GC code of this cache? Okay. The coordinate correction works for me on that cache page. Time for someone with a higher pay grade to step in. Same here. What an odd glitch. It could be that the cache page had not finished loading before you clicked the pencil. There are a few scripts that need time to load, and if areas are clicked before they have finished loading, they can open different links. I can't remember this happening for this particular link, but it's a possibility.